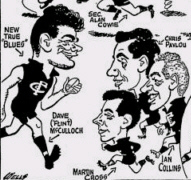 Chris Pavlou was a quick, skilful winger who was considered a future star by the Blues soon after he was spotted and personally recruited by Carlton coach Jim Francis in 1958. Barely three seasons later however, his career was cruelly cut short when he wrecked a knee in a match against Footscray. Although that crushing disappointment occurred before his 22nd birthday, from then on Chris devoted the next 50 years of his life to the Navy Blues, and his outstanding record of service ranks him as one of the club’s great servants. Pavlou was already a devoted Blues fan when Jim Francis happened by the Frankston Football Club on that fateful summer afternoon, where his eye was caught by the agility and cheeky confidence of the 18 year-old son of the local fish and chip shop owner. Francis was on the lookout for small, clever types to give the Blues some sparkle around the packs, and Pavlou fitted the bill. With stars in his eyes, Chris couldn’t wait to get to Princes Park, where he was handed the number 35 guernsey and the enormous ask of roving against one of the greats – North Melbourne’s Allen Aylett – in his first senior game in round 2, 1958. The Blues lost that scrappy encounter by six points, but Pavlou was on his way. Between 1958 and 1960, he racked up 17 matches and 7 goals in a variety of roles, before the match committee decided that his best position was out in the open spaces on centre wing. Sure enough, from the first bounce of season 1961, Pavlou struck a rich vein of form and became a daunting opponent for the game’s best wingers. Melbourne’s Brian Dixon and South Melbourne legend Bob Skilton were just two of the opponents who lowered their colours to the young Blue speedster, prior to that awful moment on a cold Saturday afternoon at the Western Oval in July. While fighting for possession in a pack close to the boundary, Pavlou’s leg tangled with an opponents’ as he was tackled, and the ‘crack!’ as he went down was audible to much of the crowd. These days, an AFL player suffering a similar injury faces surgery, followed by an eventual return to the field within two years. But in 1961, such expertise was just a dream. Although he did eventually attempt a brief comeback a couple of seasons afterward in Tasmania, Pavlou’s playing days ended in tears of frustration as he was stretchered off the field. Keen to remain involved in football, Chris acted as Carlton coach Ken Hands’ runner in the latter half of 1962, then took on a four year tenure as senior coach of Tasmanian club East Launceston. Coincidentally, the work he put into developing the club’s youngsters paid off the year after he finished his contract, when the Demons won the 1967 NTFA flag. By then, Pavlou was back on the mainland, renewing ties with Carlton and pitching in whenever help around the club was needed. In 1973 he was appointed Under 19 coach and embraced the challenge with his trademark enthusiasm. During his time with the squad, he was directly responsible for recruiting 1979 Norm Smith Medallist Wayne Harmes, as well as mentoring many members of the 1979, ‘81 and ’82 Premiership teams. Over the next twenty seasons, Chris continued to serve Carlton in many ways. He was the driving force behind the Past Players association for twelve years, as well as Chairman of the Historical Committee. Then, in the early years of the new century, he stepped up in the time of the club’s greatest need, to serve on the Board of Directors. In 1993, in recognition of his tireless efforts, Chris was awarded Life Membership. Former team-mate Vasil Varlamos summed up the general reaction throughout the club by saying at the time; “I have never known anybody to love a football club like Chris”. In 2011, as the Navy Blues began to build once more toward their rightful place among the elite teams of the competition, Chris Pavlou was diagnosed as suffering from cancer. After a long battle, he passed away on Sunday, 15 January, 2012, with Mary - his wife of 47 years - son Anthony, and daughters Trish and Louise beside him. Contributors to this page: blueycarlton , pblue , molsey , PatsFitztrick , p(12)terg , Jarusa and admin . Page last modified on Wednesday 05 of February, 2014 07:55:14 AEDT by blueycarlton. 1984 Reserves 2nd Semi - Peter Tossol crashes over Brendan Hartney. 2009 Rd 1 NAB Cup - Cameron Cloke and Petrie at a stoppage.